This Bacon, Beet, and Butternut Squash Sorghum Salad adds not only a pop of color to your winter menu, but great flavor from the root vegetables and the light vinaigrette. Winter in New England is in full force with the first winter storm this week. From blizzard warnings to snow emergencies, we’ve done this before. Being from the Caribbean and having settled on New England as our home of choice for the next few years, the cold weather makes me crave color. Nothing against those rich, brown stews – but that’s it. 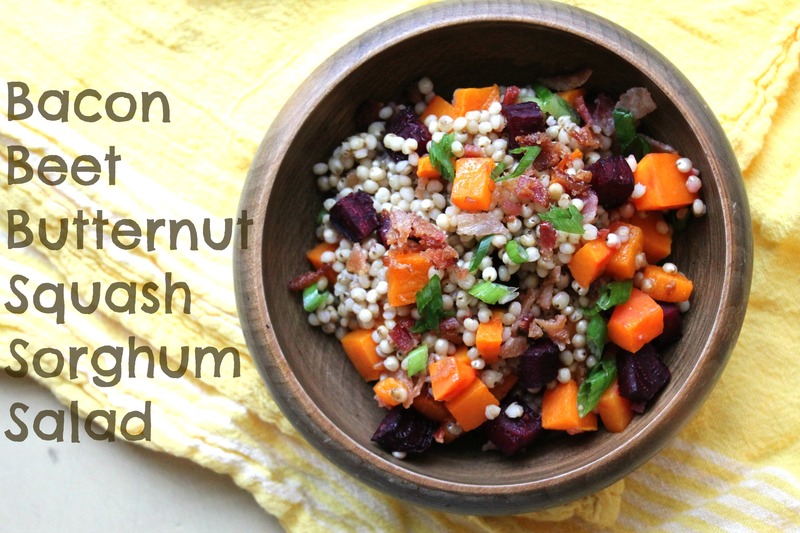 The brown color gets me down, so I created this Bacon, Beet, and Butternut Squash Sorghum Salad to add a burst of color and flavor to your winter menus. Sorghum originated in Africa thousands of years ago, and then spread through the Middle East and Asia via ancient trade routes, traveling to the Arabian Peninsula, India and China along the Silk Road. Today sorghum remains a staple food in India and Africa, yet it is still relatively unknown in many parts of the world. This gluten free grain is an excellent source of dietary fiber and a wonderful way to include the health benefits of whole grains in a gluten free diet. This salad is packed with amazing textures and flavors. The roasted beets and butternut squash provide an earthy flavor, along with natural sweetness that balances out the salty bacon and chewy gluten-free grain. Want to make this vegan? Skip the bacon! It’s already gluten-free and delicious, so I’m sure your family will love this salad recipe. 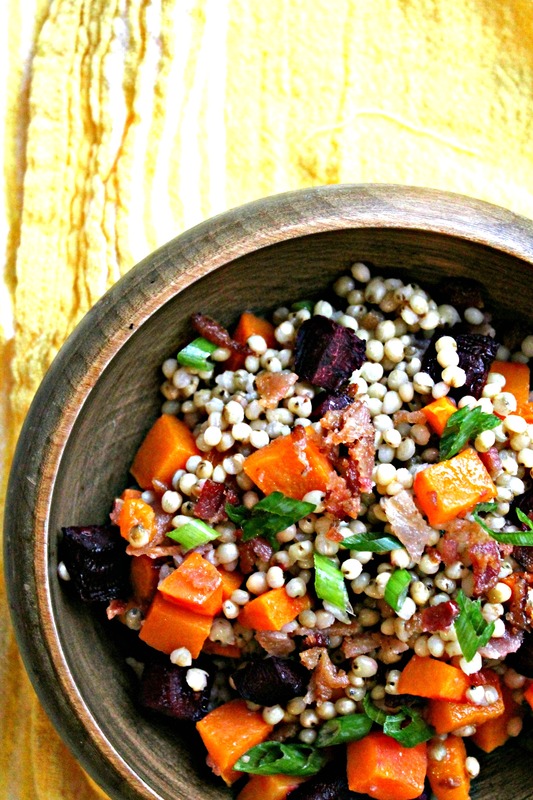 A great addition to your winter menu, using root vegetables and sorghum, a gluten-free grain. In a small saucepan, add sorghum grain and cook with 1 1/2 cups water. The ratio when cooking sorghum is 1:3, sorghum to water. Quickly boil and once simmering starts, reduce heat to medium low and cook covered for 50 minutes. Drain and reserve. While sorghum is cooking, roast cubed butternut squash and cubed beet for 30 minutes, until tender. Cook bacon strips in oven for 10 minutes, until crisp. Finely chop and reserve. To make salad: in a medium bowl, fold together the cooked sorghum, squash, beets, bacon, olive oil, vinegar, and scallions. Season to taste and serve room temperature. LOVE everything in this salad!!! I live this dish. Just made it. Question. How do you keep the beets from turning your entire dish pink? Seriously…this looks fab Nelly. Fab. I am drooling!! Love the smoky sweet combo! I love how colorful this salad is, Marnely! And with all of those awesome flavors, I know it would be a delicious, healthy treat to start off the new year. Thanks for sharing! This is a beautiful salad Marnley! It’s summer over here in Australia but I can still imagine devouring a big bowl of this at any time of day. I’ve never actually used or eaten sorghum to my knowledge… I’ll have to hunt for some. Thanks for introducing a new grain into my repertoire, yum! Happy new year!